Yes, you heard this before. The Death of Cable TV. Yet, it hasn’t happened. 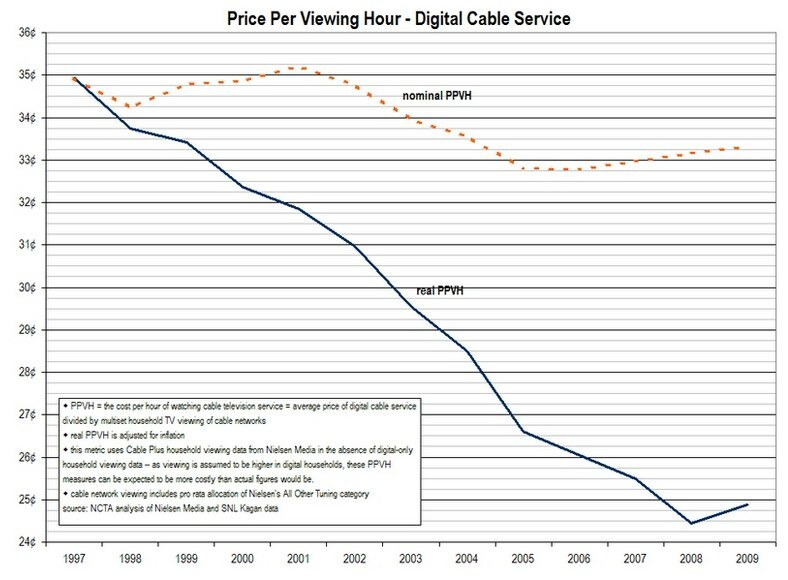 But now, so many disruptions are happening in the video space, cable tv is really stepping towards the cliff. Don’t expect the cable industry to just give up. We’ll get some new insights next week when the largest U.S. cable operator (23 million cable customers), Comcast, reports its Q3 earnings and subscriber count. Comcast cable customers dropped nearly 3% in Q2 compared to last year. In Q2 for the industry overall, a record 711,000 subscribers abandoned cable tv, and six of eight operators suffered their worst quarterly subscriber losses ever. Steve Jobs bragged this week that Apple has already sold 250,000 new Apple TVs. The first Apple TV shipped in 2007. It had its fans but didn’t take off like the iPod or iPhone. The second generation of Apple TV’s launched just last month. MG Siegler really likes the device, but admitted it’s not yet the killer device in the living room. To get there, he said, would require tv network subscription packages. “Watch Instantly” is booming at Netflix. A shocking statistic came out this week. 20% of Internet traffic during peak times in the U.S. is coming from Netflix. For more on Netflix’s plans, see Sarah Lacy’s interview with CEO Reed Hastings. Hulu Plus will be coming to the Roku box in the fall. For some, the Roku box may be the first step towards eliminating cable. Boxee announced the new Boxee Box will ship next month, both if you pre-ordered from Amazon or want to buy one in stores. Flurry reported Apple’s iOS Apps are responsible for the recent downward trend in TV ratings. The actual cause may be a bit broader. A TechCrunch post Friday suggested the future of TV is HTML5. With all these alternatives, a J.D. Power and Associates survey released this month said consumers are less satisfied with the monthly pay-TV bills and cable subscribers are more likely to feel ripped off than telcom or satellite TV customers. Why Does Cable TV Exist? When cable tv first started in the 1940s, it was a disruptive technology. Community Antenna Television (CATV) solved a problem. Some homes, in mountainous regions, cities, and locations far away from the over-the-air broadcast transmitters couldn’t get a good signal. By setting up a large community antenna and retransmitting the signal on coaxial cables to those homes, the reception problem was solved. Some claim the first system was set-up in Mahanoy City, Pennsylvania and cost subscribers $100 per hookup plus $2 a month. As the industry grew, cable operators began to pick up distant signals, providing new programming choices for consumers. Even homes that could receive the over-the-air signals signed up for cable. And cable started producing its own exclusive, original channels. In 1975, HBO became the first cable network delivering its signal across the country, via satellite to cable systems, which then re-transmitted it to consumers. Ted Turner (“I was cable before cable was cool“), launched the first basic cable network distributed by satellite, WTBS, in 1976. Cable also offered local community programming, not available on the broadcast networks. I remember watching a news show at home produced at my junior high school. At the time, this blew my mind. But all these once ‘cable-only’ benefits have changed. DSL, cable (yes, cable – more on that shortly) modems, and perhaps future fiber to the house mean video has many other routes to the home. The once exclusive cable-only content is now becoming available elsewhere. At first, cable shows started appearing on DVDs after their first run on cable. But now, there are many more options. Cancelcable.com lists some non-cable ways to find your favorite shows. And local and user generated content now has a global reach and can be shared in a community of viewers with common broad or narrow interest. Revenue per viewer-minute is much less online vs. broadcast. This could change as more ads appear on the web distribution and they become more targeted and interactive. Also, show or channel subscriptions could solve this problem. The one thing that cable does have going for it is: its relatively easy to use. Make a call, someone comes over to your house and hooks it up, and then you control it with your remote. (Well, you may have waited for hours on hold for someone to answer your call and then waited all day for the installer to arrive.) Up to now, you had to be a tech savvy person to cancel cable and hook up your own system. No one from Google, Apple, or Netflix is going to come to your house and help you hook the new devices up. As Danny Sullivan found out, hooking up your Google TV is not quite ready for prime time or the masses. But, expect it to improve. And other offerings, such as Apple TV, are making it easier. The cable alternatives are moving from technologies only early adopters use to ones the broader market can figure out. The cable tv industry is no stranger to competition. Cable survived competition from the DVD rental store. (Blockbuster filed for bankruptcy. Apple just killed the optical drive in its new laptops.) Satellite TV providers DirectTV (18.7 million customers in the U.S.) and Dish Networks (14.3 million customers) have some loyal customers, but haven’t been able to stop cable. But, the internet will be a tougher challenge. Yeah, right. That’s not going to convince any cable subscriber looking at their monthly bill. The cable industry has resisted “a la carte” pricing, allowing customers to pick and choose which channels they watch and pay for. Cable networks make part of their money from subscription fees paid by customers to the cable operators and then to the networks. So smaller networks could go out of business under such a pricing plan. There’s also a debate over whether “a la carte” pricing would save or cost consumers money. Internet TV already offers pick and pay pricing options. New media can handle this much better than old media. For my money, I think I’d come out with a big savings under an “a la carte” system. While the cable industry is losing basic cable subscribers, they are still doing fine financially. Comcast stock is up 15% so far this year, vs. 9% for NASDAQ. Comcast’s internet business (cable modem users) is growing. Comcast, teaming up with Time Warner cable, is also pushing TV Everywhere, which puts TV channels online and behind a paywall only cable subscribers can view. And of course, Comcast is planning to merge with broadcaster and cable network giant NBC Universal in a complex transaction. But the new joint venture won’t include Comcast’s cable systems. The deal still needs regulators approval, and the FCC has asked the companies how the merging of the biggest broadband provider and major content firm will impact the distribution of online videos. There’s also speculation that cable boxes could come with ‘Google TV’ built-in for an additional fee. But, would consumers really choose to pay the higher fee and keep their cable box, when other options will be cheaper? I actually still have cable. I’m inches away from dropping it, but there are still a few shows not available elsewhere that my wife enjoys. But, it’s hard to imagine those shows won’t be available elsewhere in the near future. I know a lot of folks who keep cable for live sports, but cable surviving as a sports-only service is hard to fathom. More than a year ago, writer and entrepreneur Paul Kedrosky wrote “Many people are coming to the correct conclusion that in the age of Hulu, Boxess, Bittorrent, etc., that cable TV is an over-priced relic of another entertainment age.” Now that the likes of Apple, Google, Netflix and others are aggressively joining the game, the days of that over-priced relic seem even more numbered. Update: Comcast reported it lost 275,000 basic subscribers in Q3. An update to this post can be found here. MG Siegler and Jason Kincaid talking about Google TV, Apple TV, Boxee on this week’s OMG/JK.